The internet, as we all know, is an amazing resource for so many things. Including your wedding! Many of the clients we work with are destination brides so emails and photo sharing is a great way to try and achieve our client's vision. Pinterest is a GREAT tool for conveying your vision to us and other vendors you may be working with. With seemingly endless amounts of inspiration, it was basically built for this type of thing. 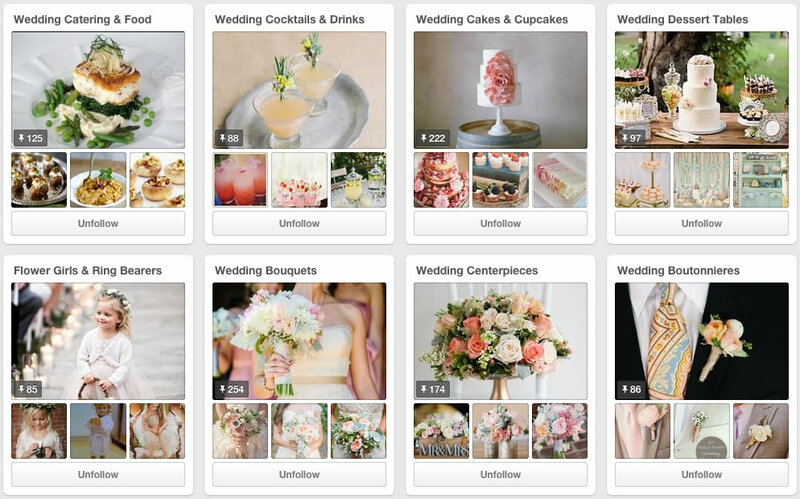 We encourage each of our brides to create a Pinterest board for their wedding. Some couples may not be familiar with how to use the site if they are not involved with social media. If that is the case for you check out this website with some instructions on how it works. While Pinterest can be a great resource it can get out of control, quick. As you may know, if you have ever had a long Pinterest session. It is easy to get carried away quickly, here are some tips to harness this tool to build your wedding Pinterest without going overboard. Do create multiple boards While having one giant wedding board for inspiration is great, but having some more specific ones is big help in getting your thoughts organized. For example, a strictly bridal beauty board makes it easy for your hairstylist and makeup artist to navigate and get a better sense of your vision without having to scroll through a bunch of pics on table settings. With that said though, it's worth giving them a quick glance at all the details to ensure your beauty look lines up with the overall vibe you're going for. Other separate board ideas include; photography, flowers, bridesmaid dresses, cakes and décor elements. Do change the captions Whether you're repinning a dreamy dress or adding a romantic updo to your wedding board, it's important to personalize each caption, making sure you're very specific about what it is that drew you to the photo in the first place. For example, was it the breathtaking lace back on that dress that really caught your eye or the understated floral crown the bride wearing it in the picture was rocking? Taking the time to be descriptive now will save you time and frustration (especially when it comes to communicating your vision to vendors) down the line. This way you will start to see common threads in your style and can help you and your vendors to see your vision, without clouding. Don't be naive Styled shoots are wonderful sources of inspiration, however, exact duplication all the intricate details for is often impossible and unrealistic. This is for a couple reasons. First off, a lot of the specialty rental items (like lounge furniture) you see on Pinterest aren't that easy to come by. And if you can find them, they likely come with a high price tag! That doesn't mean a look can't be achieved on a smaller budget but don't expect an exact replica, there are so many variables, It was taken in a specific location, with specific lighting that is often dependent on weather, and a million other things that come together to produce a one-of-a-kind photo. Do know when enough is enough If you're constantly searching for the next best thing, you'll never be satisfied. So once you've settled on an overall look and style, STEP AWAY from the computer and start bringing your vision to life. Work with your wedding vendors to put your own personal touch on some of the photos and trends you've pinned. Who knows, maybe your wedding will wind up inspiring other brides because it's not the exact same as everyone else's on Pinterest! Check out our Pinterest boards to see some of our wedding inspiration!